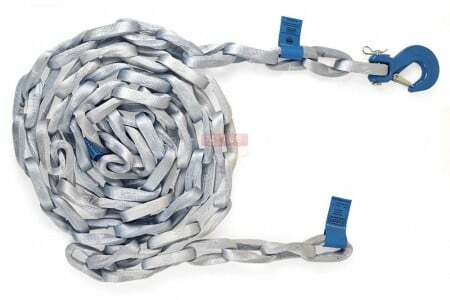 The Tycan Chain is made from Dyneema fiber which is the worlds strongest fiber. 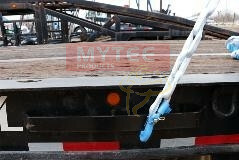 It is 8x lighter than a conventional steel chain, making it easier to handle, strap down and carry. It is more flexible than that of a steel chain, but still gives you all the power without compromising the performance of safety. 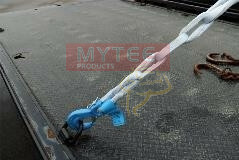 One Tycan chain can replace flat straps as well as the hazardous and heavy chains on your truck, making your truck over all lighter and safer. Reduces damage to your cargo or trailer. 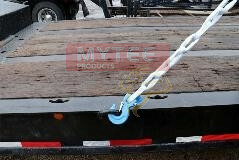 Tycan chains are rated for lashing and load securement only.